Teachers have enough to do. 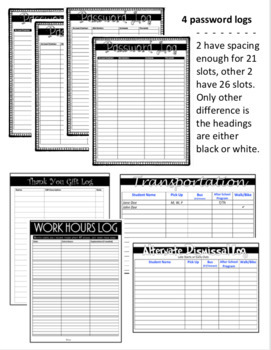 Don't waste your time putting together or hunting for those miscellaneous forms and logs that are just plain necessary. This pack includes Password Log(s), Thank You Gift Log, Work Hours Log, Transportation Form, and an Alternate Transportation Form. Password Logs- there are 4 total. 2 include slots of 21 entries, only difference is the headings are either white focused or black. The 2nd two password logs have enough slots for 26 entries. Thank You Gift Log- when students bring you gifts, write it down. Then as you prefer thank you cards you have a log of exactly what they gave you. Hey, you may even want to save this log for future reference when you still appreciate and enjoy that special gift(s). Work Hours Log- recently my school has had to track our hours outside of contract time. Handy and easy. Help your stress level by using this log that's already prepared for you and visually appealing. 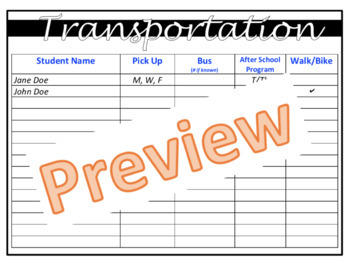 Transportation Form- I put this out at Back to School Night (Open House). Have parents fill in their info. for their child. 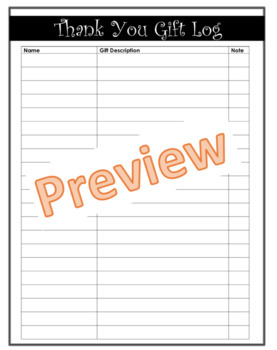 Otherwise you fill it in as you get that information or use for your sub binder. Alternate Transportation Form- with weather situations, early release days, late starts, unforeseen situations, having your schedule disrupted already causes commotion. 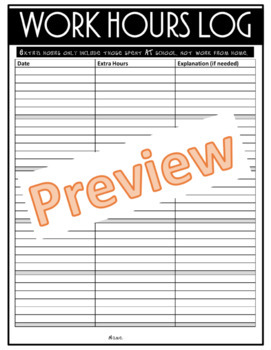 Have this form ready and handy so if/when the time arrives and majority of your dismissal procedures may change you are ready to document it so your prepared.